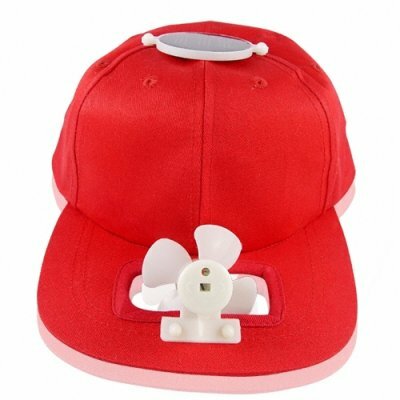 Successfully Added Solar Powered Fan Cap - Green Powered Apparel to your Shopping Cart. Sports hat with a fan built in and completely solar powered for the ultimate in gadgety green powered apparel, in a 3 piece lot to give you the very best wholesale purchase price and shipping The attached solar panel on the top of the cap transfers collected solar energy directly into electric power which turns on the fan up to 1850 cycles per minute for an agreeable amount of wind directly on your face. Simple to use but extremely useful for hot and windless days, show your love for mother Earth and conserve energy for future generations with this low cost solar powered gadget direct from China. If you purchase "one piece" of this item, you are purchasing a lot of 3 separately boxed products, delivered to you in one carton. This is so that we can give you the absolute best price for the shipping of this low-cost wholesale product. To calculate the price per piece, divide by three. Fan Rotation Speed: 1850 cycles/min. Even lower prices available for you if you\'re ordering in larger wholesale quantities. Get your samples first then contact us for your personal discount quotes!